If there’s one scent that reminds me of summer, it’s the fresh, classic notes of flowers filling the rooms of my parent’s home in Kent. I rarely have the time or funds to fill my own home with flowers, but they are as much of a feature of my parent’s as a roast dinner cooking in the oven or dogs barking at the door. To remind me of that homely scent, I fill my bathroom with floral scented products at home – and this week, I’ve shared a few of my favourites with you. 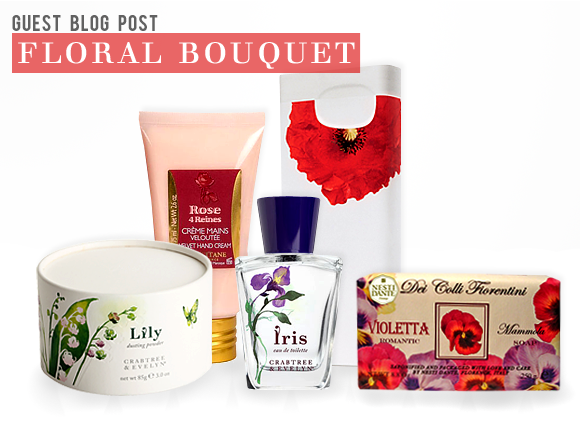 Read on for my perfect floral bouquet of beauty! Iris flowers take their name from the Greek word for ‘rainbow’, referring to the vast spectrum of colours amongst the species. The colour most of us know and love best is purple, which Crabtree & Evelyn’s Iris Eau de Toilette, from £11.25, pays homage to. Sometimes the simple fragrances are best – and it’s certainly true of this single noted, floral-woody scent. Love the sweet scent of violets? The next product in your floral bouquet should be Nesti Dante Dei Colli Fiorentini Sweet Violet, £4.25 – a cleansing bar that combines a classic fragrance with a nourishing and effective vegetable base. The packaging is stunning too. The red poppy apparently has no scent, so Kenzo dreamt it up with their decadent Flower Milky Shower Cream, £18.70. Only lightly perfumed, it makes a luxurious start to the day and leaves skin feeling smooth and beautifully moisturised. No floral bouquet would be complete without a summer rose – and L’Occitane Rose 4 Reines Velvet Hand Cream, £14, fits the bill perfectly. Capturing the sweet, heady scent of roses in a subtle form (a mixture of Grasse, Bulgarian, Moroccan and Turkish roses), the velvety cream leaves hands feeling impressively soft. If you love Lily of the Valley, I strongly recommend adding Crabtree & Evelyn Lily Dusting Powder, £18, to the mix. It’s undeniably pricey for a body powder, but so worth it for the summery scent of the dainty flowers, blended with dewy greens, woodland mosses, musk, and ylang ylang. a lovely light fresh powdery edt with good staying power for an edt. I bought this on chance as it is an "iris" fragrance & I could not afford my usual favorite prada infusion d'iris at present. this is similar, the fresh powdery fragrance without the orange notes in prada, & not as intense as prada. this is a good everyday alternative to my favorite, but if money was no object, i would choose infusion d'iris. i would recommend this perfume, & would buy it again. This entry was posted on Monday, August 20th, 2012 at 9:30 am and is filed under Bath & Shower, Fragrance, Guest bloggers, Skincare. You can follow any responses to this entry through the RSS 2.0 feed. You can skip to the end and leave a response. Pinging is currently not allowed.